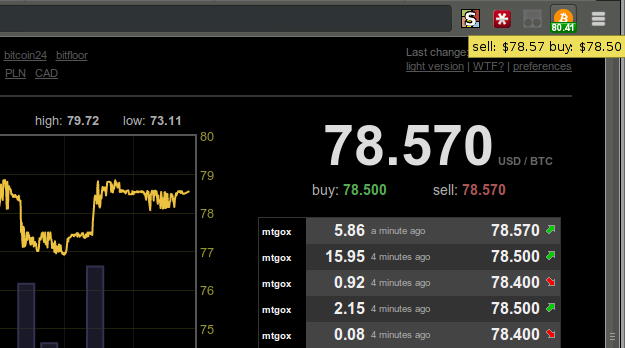 This extension will fetch Bitcoin price from mtgox api.The extension icon will show you the current value. The extension will also notify you about drastic value changes. clicking the extension Icon will open your favorite online chart site. check the extension options to configure it the way you like. No currency change in options? I would really want to se euros, not $. You are so fast 🙂 Thanks! Nice update! Cheers, very useful extension. Well done, Yoni. Works nice. Thanks. Any plans to place it in the cloud and offer alerts by email? but I don’t think I have any plans of doing so ( I don’t really see what advantage it would have). I’m thinking of improving the alerts but I’m not sure if mail alerts will be available any time soon. I need to check this option but I think it will probably be too complicated to implement as an extension. I’m thinking of adding an option to get sms alerts but this probably will also take some time to implement. 0) Is there a better place to discuss your extension? Like a forum thread or something? 2) What’s going on here? bitcoinity shows that the price hasn’t been above $80 for a while, and even the hover-text of your extension shows the same price, around $78.50. but the label in the badge shows $80.41. Where did that come from? I see it occasionally, that the badge label is higher than the price has been recently. 0 ) I’m trying to follow the commnets here so I think its one of the best places ( for some reason tho wordprees did not e-mail me about your comments and I need to check why). which I also try to follow. 1) I think I uploaded all the changes to my repository. You can check the version in the manifest file. If I forgatten some update please let me know. Oh, I see what’s happening. You’re using the ‘last_all’ price from MtGox which includes trades in all currencies, converts to my local currency, whereas bitcoinity uses only trades in my local currency. If I replace ‘last_all’ with ‘last’ in the source then I get the behaviour I want – less alerts about the price moving, because all moves are real moves, not the result of currency conversions. https://en.bitcoin.it/wiki/MtGox/API/HTTP/v1 tells me that “last is always the same as last_all” but that’s untrue. It looks to me like last is always the same as last_local. Hi, I really liked old version of this extension, because graph was so much simpler and easier to understand. Can you give me Pop app chart address of old one, or can I somehow downgrade it to 1.4? Thanks! Which chart was it ? But I’m not giving this coins cause I use your chart in the extension. are the ones who need to tip the service they are using. I’ll give you the coins cause your charting was the only one who didn’t crash yesterday when Mt.Gox went haywire. Can you add [link-reducted] to your extension? Are you using the extension ?